Last Friday, I noted that Bob Ehrlich of DTC Perspectives re-estimated that DTC ad spending will decrease by 10% in 2009 compared to 2008. I described this as "DTC Spending Will Be Decimated in 2009, Experts Say." In his blog, Bob takes exception to my use of the word "decimate" and says "I do not consider that level as fitting the common understanding of the term 'decimated.' That term fits what has happened to banks stocks, housing prices, and my financial portfolio." Just an interesting aside about the word decimate before I get to the real point of this post. The word decimate means...and to some of us means nothing else..."to cut down (an assembly of people, usually and army or hostages) by a tenth"...not "two tenths" or fifty percent or any other degree or number and neither 'enormously' cut down/diminished/destroyed/reduced nor "totally destroyed", nor anything else than its singular meaning (see here). So a purest, like me uses decimate to mean a reduction by 10%, whether it's Roman Legions or DTC spending dollars. "The popular meaning of decimate, 'to destroy,' now predominates because the need for a word meaning 'to kill one person in ten' -- the original, if archaic, definition of decimate -- has greatly diminished. Even so, the popular meaning is not accepted by everyone, and it is often better to use annihilate, exterminate, destroy, or devastate." This blog definitely does NOT represent the popular view or the lowest common denominator view or the majority view. So it is natural that I would not use the "popular" definition of decimate. Decimate, annihilate, toMAYtoe, taMAHtoe, let's just call it a bad omen -- I think Bob would agree with that. Bob, however, is an optimist and he ended his post with this prediction: "Let me boldly predict that by 2012 we will see the $5.7-$6.0 billion spending level reached for DTC up from $4.8 estimated in 2008." I included Bob's prediction in my famous DTC Ad Spend chart below. The red bars are based on information from TNS, the black bar is my prediction (and more or less Bob's) for 2009, and the blue bar is Bob's most optimistic prediction for 2012. That's a pretty healthy recovery and I hope I live long enough to see it. But there's a BIG question mark between 2009 and 2012 that we need to think about. And if you think about it, you might learn a thing or two. One thing to think about is what the DTC spending MIX should be in order to have a recovery. Bob says he is "media agnostic" (actually he said "I am dispassionate about all media") and "Media is just a tool to get more awareness and eventually scripts." Oh Bob! I feel sorry for you. For many people, the media is the message (where have we heard that before?). I like to think media has a message. TV's message is "mass, waste, low ROI." For many marketers it also has the message "glamour" and "I made it to the big time!" Unfortunately, not too many pharmaceutical marketers are getting the message from the consumer, which is "interactivity, dialog, and empowerment." You get none of these things from TV, which dominates the typical DTC budget (see chart at left, click on it to enlarge). Before I get to evangelizing about "my" favorite media, let me say this: Why do we want the dollar amount of the DTC budget to keep increasing? That's the goal of ad agencies, not product managers -- or it shouldn't be. The goal should be increasing effectiveness in getting your message to the right audience. Bob understands this, at least in principle. "Spending will evolve each year to more targeted media as it should," he says. Yet, if we look at Internet spending over the years, it has not budged as a percent of spending. Obviously, pharmaceutical marketers should increase their spend in interactive and new media. 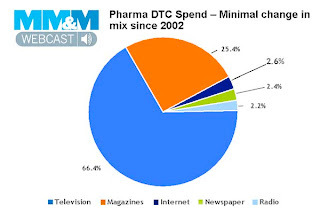 I suggest that they simultaneously decrease their spending on TV -- it's becoming less and less effective as several pharmaceutical company CEOs have said publicly. If the mix were to significantly shift away from TV to Internet, I predict that DTC spending would remain below $5.0 billion through 2012 -- because marketers will get more bang for their bucks on the Internet than on TV. It's just too bad that we look at dollars spent as a measure of success and growth when we should be looking at effectiveness, aka ROI. Imagine a chart that plotted DTC effectiveness over the years. Now imagine what it could look like between now and 2012. P.S. 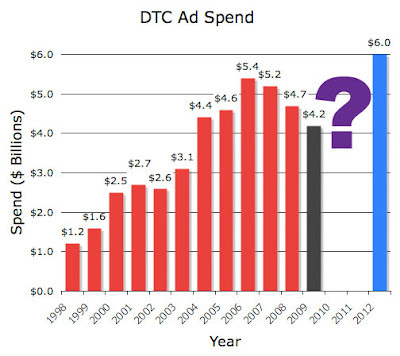 OK, let's get back to predicting dollars spent on DTC advertising in 2009 compared to 2008. 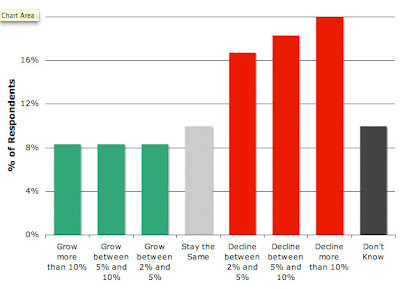 That was a question in my "Future of DTC Survey," the results of which will be published in the January, 2009 issue of Pharma Marketing News (see a preview here). Subscribe now and get it FREE by e-mail. I've long thought that too much focus has been on media spend as a measurment. How about results? Perhaps the current economy will help that pendelum swing. charge commission on any of our media buys. We chose to do this because we've always felt the commission-based system was based on an outdated model and didn't incentivize agencies to do the right thing on behalf of their clients. "TV's message is "mass, waste, low ROI." For many marketers it also has the message "glamour" and "I made it to the big time!"" That last bit is the critical one. This isn't a pharma only phenomenon to be sure. It's ever industry. Here's my stand on this...if product managers were never able to say at a cocktail party "hey did you see the commercial for X...that's mine." there would never be another TV ad. The glamor is what keeps it going. Attending the shoot, seeing rough cuts, maybe helping pick the music and casting the actors, and, of course, having the authority to write a big, fat check is all a great ego-trip for a a marketer (from one who has fallen for it). Let's bring glamour to the Internet! Online Video is becoming big on the Internet -- I embed YouTube video clips in my posts all the time. It's very viral and I KNOW it drives traffic to my posts. You can still have "shoots" and all the trappings of production. And YouTube is beginning to have the cache of broadcast TV -- "Did you see my YouTube viral video? No? Dude, why not?" I do see that some pharma companies are placing video on their web sites and on YouTube. Most of the time, though, it is repurposed TV ads. Great post John. I think the focus should be on ROI, not dollars spent as you mention. However, if we focus on effectiveness, doesn't that make many agencies nervous? After all, if measurement reveals that an expensive campaign is not working and the client decides to can it, that is a big problem for agency revenues. That's why I think the conversation has focused on spend rather than results -- especially if people are already saying that TV ads are not very effective. However, I would caution about assuming that the Internet is any more effective than traditional media models. What we're seeing in other industries is that marketers are focusing less on the "social" component of social media and more on using traditional advertising to reach eyeballs on Facebook, MySpace and other social networks. Guess what's happening, Facebook is having trouble turning its eyeballs into dollars because people are not clicking on soc net ads. So, when we say "digital" we have to do a better job of defining what that means and conduct rigorous assessment to help us optimize our media spend. Calling the Internet the holy grail without evidence to back it up is not a good idea. As we are still in the experimental stage, we have some wiggle room, but as budgets get tighter it's going to get a lot harder to justify spend without good ROI measures. ROI is difficult to measure for pharma no matter what the medium. Especially if they want to link it to scripts written. Scripts written should be the ROI endpoints of choice for physician marketing. For DTC marketing, there should be some other endpoint. Even some big-time DTC marketers are claiming that DTC does not influence scripts. How about measuring disease knowledge and treatment awareness? Mr Ehrlich has a major conflict of interest here and has to "kiss up" to the industry. As thus he is not in the least objective.